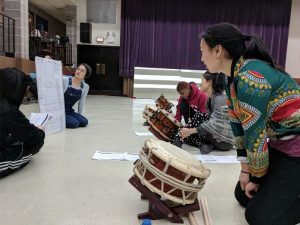 As a group accustomed to learning kumidaiko pieces either composed by members of Ho Etsu or derived from familiar works in the taiko world, the task of preparing the complex repertoire of Edo Bayashi in advance of a master workshop with Kyosuke Suzuki forced us to get creative with our teaching and learning methods. 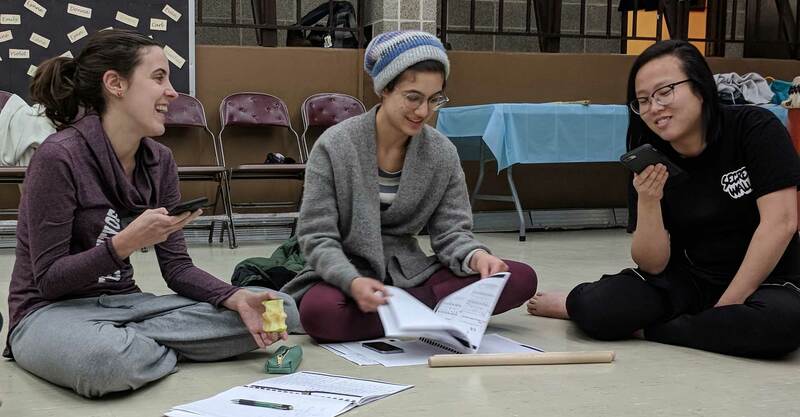 Lucky for us, Tiana Pyer-Pereira, overseer and coordinator of Ho Etsu’s rehearsal schedule, was up to the daunting task of organizing our group efforts in an entirely new and exciting way. As our autumn show season wound down and we turned to winter rehearsal priorities, the question of how to approach Edo Bayashi loomed large. How would we do this? How would we teach and learn a collection of challenging and unfamiliar music in only three months while balancing other group commitments? 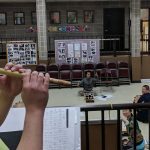 As the person in charge of Ho Etsu’s rehearsal schedule, I wanted to develop an approach to Edo Bayashi that would work for the entire group. Our high-level goal is to get everyone to proficiency on the shime parts for our April workshop. Our stretch goal is to have a handful of players proficient across all five instruments to present alongside Suzuki-sensei when he visits in spring. With those goals in mind, here are the principles we’ve adopted to structure our song learning. Often, when Ho Etsu starts learning a new piece, we have one or more clear song leaders – the person who composed the work, for example, or one of our designated music directors. With Edo Bayashi, we face a new challenge: how do we learn a song that no one in group has mastery over? To me, this challenge also provided a tremendous opportunity – the opportunity to democratize the teaching process. 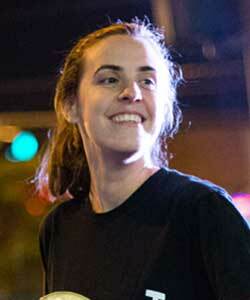 Instead of placing the pedagogical burden on one person, I wanted everyone involved. 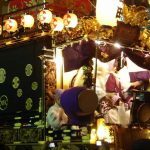 To start, we chose what we considered the three most accessible shime sections – Shōden, Kamakura, and Agari Yatai – and assigned everyone in the group to teach one of these three. Teaching suggestions were left intentionally broad; each group could present their section however they wanted. The only requirement was that, by the end of their session, the teachers had to be sure everyone in Ho Etsu had memorized the kuchi shoga for that section. How they got us there was up to them. So far, each group has risen to the challenge, and each has used slightly different techniques. As someone who thinks a lot about learning styles and helping the group tap into everyone’s individual strengths, this has been a watershed moment. Outside taiko, we each take a variety of roles in our professional and academic lives. 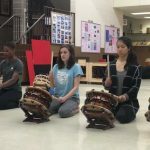 This distributed teaching style has helped bring out people’s strengths as instructors in ways we haven’t seen before, leveraging their expertise from other settings to support our work at taiko practice. On the individual level, this teaching method means that everyone becomes an expert in at least one section of the song. In a piece that can initially seem long and winding, with few easy hooks, distributed teaching means that everyone has at least one section or point of entry that feels like their own. The Edo Bayashi book is a tremendous resource, but also provided our first learning barrier. Not everyone in Ho Etsu can read Western musical notation. No one can read tetsuke pattern notation. This meant that simply handing everyone a copy of the book and telling them to get started wasn’t going to work; we needed to create and share resources to unlock our ability to learn from the material. 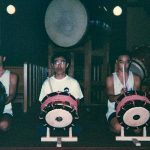 Dana created copies of the translated music for everyone and walked us through how to read each line and each part (shime, odaiko, atarigane). During our first rehearsal, we listened to the recordings two or three times so everyone could practice using the recordings and sheet music in tandem, marking up their copies as needed. When questions arise down the line, I wanted everyone to feel confident using these tools to solve whatever puzzle they face. Beyond that, a number of supplemental learning tools have been developed. 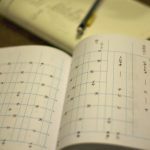 For me, someone who doesn’t read Japanese, it was important to create a cheat sheet – an index card listing katakana and their kuchi shoga translations. I paperclip the cheat sheet to whatever page I’m studying for ease of learning. Teaching teams have made different tools to present their sections: photocopies that represent repeated sections more clearly, or color-coded notation that points out similarities between shime lines. In shinobue-heavy Kamakura, we transcribed the numerically notated flute to Western notation so those who are familiar with that style can see how the melody overlaps with the drum. We collect all resources to a shared, central Google Drive folder. Here, everyone can find the recordings, scanned copies of the Edo Bayashi book, new learning tools, as well as a master list of all our questions for Eien. Whenever I want to dive back into my own learning, it helps to have a single place I can go to get myself reacquainted with our progress to date. To prepare for Suzuki-sensei’s visit in April, we’ve decided to start by focusing on the shime part. Over the next three months, everyone in the group is responsible for learning the shime for all five sections of the song so we can get the most out of our workshop in April. 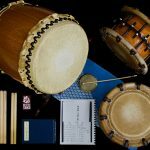 We also want to create opportunities for people to go deeper and learn the odaiko, atarigane, or shinobue parts if they want. Learning one of these parts in addition to the shime will take more time than we currently have available. The understanding is that anyone who wants to prepare other parts for Suzuki-sensei’s visit will have to do so largely on their own. 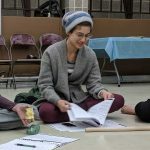 This kind of learning is important to us as a group, however, and we want to support these people by dedicating group resources, like practice time, to their work. Once we finish our initial run-through of the shime for all five sections, we’ve carved out time in practice to let people start learning other parts in small groups. Even dedicating a little practice time shows the value we place on the work individuals are doing independently to help Suzuki-sensei’s visit go well. 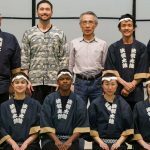 There are tons of ways to teach and learn, and everyone has their own approach to getting from Point A to Point B, but these are our guiding principles in approach to studying Edo Bayashi as a group.